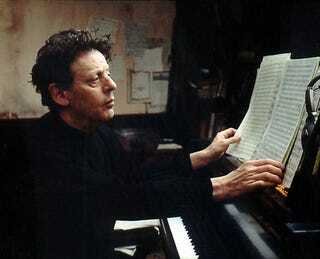 The music of minimalist-art-music composer Philip Glass shows up in sort of predictable places like the Qatsi trilogy, the film The Illusionist, and a number of documentaries. Recently, the hyper modern music has shown up in some strange places. Recently, his "Metamorphosis for Piano" was the creepy backdrop to an episode of the new Battlestar Galactica rapidly spinning out of control. Another song also appeared in the trailer for Watchmen. But it has a sci-fi sounds, so it's not altogether unbelievable. What got us? The song "Pruit Igoe" is in Grand Theft Auto IV. Totally strange. Just like Glass actually being related to This American Life presenter Ira Glass, which we thought was a joke. But not as good of a joke as JCwhitless riffing on the younger Glass in the post on the custom Grand Am with a strange passenger. BTW, stars will be taken away for making any visual comparisons to Ira Glass and anyone on staff.